I want to build my own knobby box with an Axoloti brain but have 0 / zip / nada electronics knowledge except for the ability to follow build instructions for DIY eurorack modules and the like - i.e. I can solder and that's about it. I don't know what ground is for, I don't really know what resistors and capacitors and diodes do and so on. I do have a scientific brain and did Physics at school but that is a loooooong time ago. I can find my way around the software without much difficulty. What's the best way to get my head around what I need to do to hook the Axoloti up? I was thinking of getting a breadboard, some wires and pots and the like and a beginner's book on electronics and having a go, any suggestions? Better still, is there a specific Axoloti based guide anywhere, be it YouTube video or a blog post, or a page here? And get an Arduino starter kit. MTYAS has an excellent synth build video you can watch and or follow to get ideas. And he has many other great video's as well. 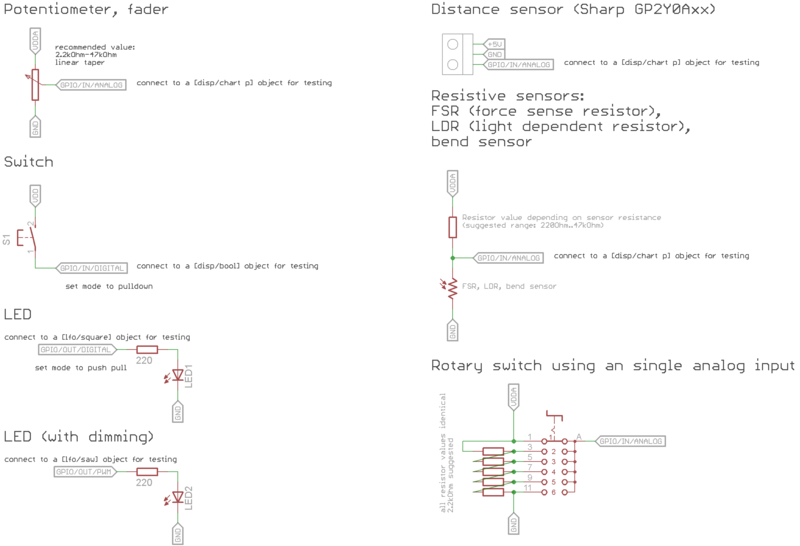 My book on Axoloti has a chapter on connecting basic electronics (potentiometer, pushbutton, distance sensor, ...) with breadboard-style illustrations. Thanks for the replies folks, checking out @mtyas's videos and Friting looks very promising. Hadn't seen your book @janvantomme, will check out the sample. How many pages in total is it? I'd be more tempted if it was an actual book, I take it this is an e-book only? The book is around 120 pages, and ebook only. That way I can keep updating the book for everybody who bought it when there are major updates to the platform. If you already have some soldering experience, really, you have everything you need. That’s just the sort of page I was after!! Thanks!